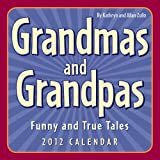 The Grandma and Grandpa calendar with a collection of funny quotes related to grandparents. Grandparents are completely smitten with their grandchildren. Being a grandparent is the single most important and satisfying role in their lives. Each daily page of the Grandmas and Grandpas: Funny and True Tales 2012 Day-to-Day Calendar speaks to this lively and loving group with an amusing anecdote, a useful tip, or a charming quote, like this one from an eighty-year-old grandmother of five who has taught dance and exercise classes for more than thirty years: "I'm going to bop until I drop." From the creators of someecards.com comes an entire year of unforgettable sentiments. 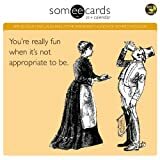 Spend your year laughing at their irreverent humor. All calendar pages are printed on FSC certified paper and use environmentally safe inks.